Most of us go through our day as educators and see things we’d like to tweak here and there: maybe a different strategy, a better schedule, a different technology. For me, I’d like to see a transformation of the way we do things. I see us as still looking so much like centuries ago –still preparing our students to be compliant, factory-line citizens rather than problem-solving creators that the world of today and tomorrow require. 1. Space: sure, many of our classrooms have changed from using desks to using tables. I wonder why we even do this. How many adults work at tables, crammed into a small space with other adults. Is this a place that we would be comfortable working? I work best on my couch with my legs propped onto my ottoman, for example. Not everyone is like me, but if we are to meet all learning styles and prepare students for life, should we have more alternative seating than just tables and chairs. Additionally, our classrooms are still, well, classrooms. They are rather restrictive with space. The hallways waste so much usable space that could be used. 2. Speaking of hallways, most public schools insist that students walk in silent, straight lines. I wonder what we are accomplishing with this. If we taught them to walk on the right side of the hallway, and speak softly, they wouldn’t be disrupting classes. I can’t help but think we would accomplish a better goal. 3. 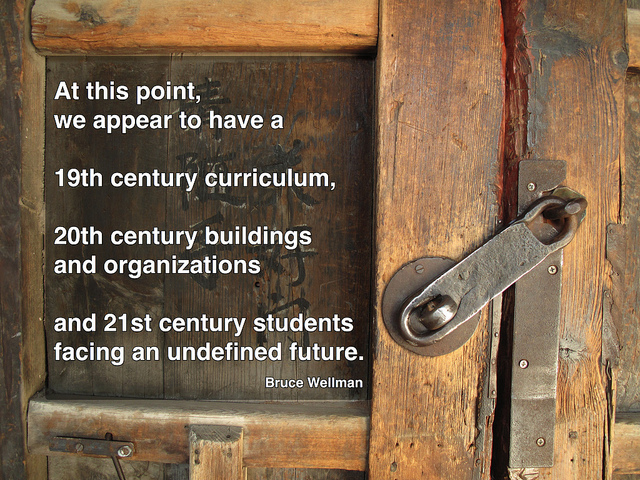 Curriculum: when will we revisit what students need to learn. When Google can tell us every fact out there, we need to teach thinking, problem solving, creation. Everything we know about school truly must be revisited. We are losing our students and time by teaching concepts that they don’t need to know and won’t ever use. I believe that we could be making so much better use of time in school.